I think that is a very good assessment from cannonball and pretty blunt. I try to be more optimistic in my posts (which I usually find pretty hard to do) but that post pulls no punches. No one can accuse Chas Hemmings of being speedy but the difference between him and Jones is that he could pick out a pass. You cannot compare the two in any way. I never saw him give a player a bollocking when he when he was at fault. I thought before the season started that we would have to endure a few heavy defeats to get rid of Jones and that has proved to be the case. What is not so easy to solve is the non existent midfield. Frankie was quite poor last season and he is only marginally better this. We really need him back to something like his best. I do however think we need more bodies in midfield. Noah Keates would have been ideal. It will be interesting to see how he plays against us. Again not much to add to what has been said before, and I agree with BenE that Cannonball has summed things up pretty well. I think BenE is being a bit unfair to Frankie though. Last season I thought that Frankie always played better when Chas was in the 'holding' role, and when Chas was out and Frankie had to fill that position it restricted him. Without Chas and not having signed anyone to fill his role I think Frankie is having the same problem again this season. I also think that BenE is a bit optimistic if he thinks that we have got rid of Jones as I get the feeling that he is part of Gary's plan for the season and won't be another Fleetwood. Team selection for Truro will be interesting again. I thought that Frankie did ok yesterday. I thought our midfield wss completely overrun from start to finish. However as I said at the start of the thread I thought there was a lot more effort and desire shown. LB makes a very good point about Chas. A few people think Case could do that role. I personally would like to see Ball there but I can't see that ever happening. If Jones sharpened up and could beat me over 100 yards I wouldn't mind him in the side. Chas is currently on holiday I believe so wouldn't have been much use at the weekend. Frome won without him, mind. I think that in the first half, particularly, Watkins and Lemonheigh-Evans were hardly in the game because of our formation 5-3-2 and Chelmsford's game plan that mainly seemed to revolve around trying to win throw-ins so they could launch them into the box (they appeared to have three different players who could do this). Frankie was more involved but only really from a defensive position. The switch to 4-4-2 was clearly aimed at trying to get them into the game more but also gave Chelmsford more license to play, which they took full advantage of. As for Jones, I think he could be the Coupe-type player that quite a few people have been wanting for years. Coupe was never afraid to bawl out a teammate if he thought they warranted it and I don't recall him getting criticised for it. Maybe match fitness is an issue but, as Mark said, seeming him close up he is a lot more muscular than fat. Clearly he isn't ever going to be the quickest centre-back (but, again, neither was Coupe) but alongside Ball, Batten or Case (all who are reasonably quick) could be fine. I think it would be interesting to see him in the middle of a back three but Gary's comments yesterday would suggest this isn't an option. As an aside, having largely been underwhelmed by Case pre-season I was very impressed with him yesterday - probably my man of the match - whilst Straker, who I thought looked quality pre-season, has so far been a disappointment. BenE wrote: I thought our midfield wss completely overrun from start to finish. I haven't really rated Artus since he's been at the club to be honest. I get the impression that he perhaps isn't suited for non league. He's got skill but doesn't tackle and at this level you have to fight for it more. At the very least I would prefer it if he was playing alongside a battler such as a Jon Holloway or Lewis Hogg type figure. Centre Backs - Good at heading? Battling? .........Much improved from Chippenham game anyway! Only two games I've seen plus pre-season so hardly an informed opinion but just an early perspective. We were talking about Coupe in relation to this yesterday. Yes, Coupe did give people a bollocking but it was when they had done something wrong and he could be as hard on himself and get just as frustrated with his own performance. Yes, Coupe was never the fittest and quickest and, yes, players don't have to be. Like yourself and Mark, I thought Janes looked like a heavy set muscly guy rather than fat. Obviously being thick-set in that manner will mean you aren't going to the quickest. The thing is that, whatever we said, the difference this time is Gary seems to have come to the same - and, to my mind, correct- decision by leaving him out of the team (and, indeed, the squad). Now, of course, the reason given is a hamstring strain and a hamstring issue could be the reason why he had trouble keeping up on Tuesday. Let's face it, Nick has had similar issues. On the subject of Nick, yes, he and Chas both came good. I am still think that they became more valuable players which retrospectively (and, more by accident than design, in Chas' case) vindicated their signings but, at the beginning they were bot not good enough. Hopefully, Jones will get good enough (or fit enough) much more quickly. The other issue that is, perhaps, more important that I go back to is Jones taking out his frustrations on other younger and less experienced players. Not great for any player and certainly not from a captain. However, perhaps it was a one-off due to this hamstring injury and we will see a improved player - physically and temperamentally - next game he plays. A particularly interesting thread - and a healthy one in respect that it shows that there are a lot of fans who feel moved to comment. Switch Miles to left back and bring back Rigg at right back - leave 'Bat n' Ball in the centre of defence - allow Watkins to play at centre forward, where he belongs - letting Straker and McCootie dart up the wings. I thought that Frankie had his best game for some time on Saturday, and I was impressed with Lemonheigh at Bognor but not on Saturday. He is only on a two month loan though so midfield will have to be tweaked soon anyway. No place for Morgan - unless Nick is injured (even then I would use Lucas instead). I did hear Jones threw his kit bag in the car and stormed off afterwards Good show of leadership there . Ad da wrote: I did hear Jones threw his kit bag in the car and **** off . Good show of leadership there . Must have been his twin brother sat on the bench before the game then. Is that a hamstring stretch he is doing? When Jones was initially signed I looked at his background, not really knowing that much about him, and it did seem as though he may be the sort of defender I thought we needed. On his displays so far he is not and it is unfair on Matt Coupe to try and compare them. Coupey was not the quickest, as has been pointed out, but he continually put his body on the line for the team and I have never seen him shirk a challenge. He led by example, gave 100% and expected the same from everyone else. Last Tuesday Jones was looking round to blame everyone except himself. The keeper is young but on Saturday he did well enough under the onslaught from the throws and the buffeting he got. Straker worries me, Aldershot fans seemed to like him last season but he has not impressed me so far. Batten was a lot better Saturday without Jones. Bringing back Dan Ball made us better, he is competitive and we need that. Cannot understand why he was not even on the bench last Tuesday. Artus is the best we have in midfield but we really need some one else here. Murphy is liked by Owers (I think he was his player of the season last year) but to me he is pedestrian and is not going to open teams up. Chas had some vision and could see a pass and we miss that. We need more movement up front and someone who can get in behind teams. Agree with MSN Steve that Watkins should play as a central striker with Lucas or Jarvis. Not seen enough of Lucas to really form an opinion. McCootie back on the right with maybe Compton on the left. Compton is not match fit but with the position we are in we need to try and change things and the only option to get him match fit is to either play him or send him out on loan. At least if he is struggling a bit for fitness he cannot hopefully do so much damage as being in central defence. SteveS wrote: At least if he is struggling a bit for fitness he cannot hopefully do so much damage as being in central defence. We probably have to concentrate on clean sheets for a while, as we don't create chances whatever system we start with. Case, Batten, Ball with Rigg at right back and Welch-Hayes at left back would be my preference, Straker doesn't inspire much confidence defensively, but might add a bit of physicality to left midfield. Restricting Chelmsford to a handful of chances should be encouraging, vastly better than the feeble effort against Chippenham anyhow. It's been mentioned about going back to a back 5 on Facebook but I don't think that is a solution. You need to have players who know each other well to do that. If they don't know each other well, go with 442 and, at least, most players know where they are supposed to be with that. A back five, by sheer dint of numbers, will be effective for a while but any opposition will suss out a team inexperienced playing 5 at the back especially after a half-time pep-talk as seen on Saturday. Even before half-time, we were getting swamped in midfield. Gary hasn't got a training session with the team before tomorrow either to drill them more as a back 5. 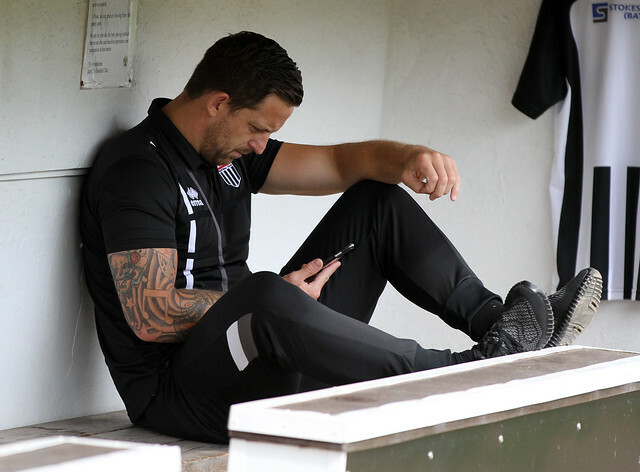 Well we certainly created chances at Bognor, especially in the first half when we looked very good going forward. The strongest teams are usually set up to withstand pressure while taking the game to opponents but watching the ludicrously over hyped premiership games over the weekend on tv reinforced my belief that defending is becoming a forgotten art. The answer, as we showed on Saturday, is to pack the team with defensive players which often works until you fall behind. And of the three matches so far, the Chelmsford one was for me the least entertaining. Liam Shaw wrote: Disagree with the comments about Artus not being a battler. I think he always puts his body on the line and is constantly closing down the ball and getting stuck in- hence why he gets so many yellow cards! I think he's also good technically on the ball but doesn't always get the chance to be in the more 'playmaker' position as he's usually the one winning the ball and closing down in front of the back four, leaving us with not really anyone in this attacking midfield role to link up the midfield and attack- probably why we end up playing long ball most of the time. Completely agree with that Liam Shaw - I think Artus is a good player and puts in 100% all the time, but because we chase shadows a lot in midfield due to lack of numbers or lack of overall pace, he doesn't get enough time on the ball to be creative as often as we - or he I would assume - would like him to be. Play a holding midfielder to tidy up the loose stuff behind him (Case probably from what we have got??) and push him forward a bit and I think you would see a much improved end product from him and much more decent service to the front men. There's a hint of Arch in that photo. Apart from the tattoos. Only highlight of these bad runs are the wacky rumours which start, with them always from an unknown third party. I'm sure Howells sat a lot further back than that! BenE wrote: Noah Keates would have been ideal. It will be interesting to see how he plays against us. Pay attention in class Marc, he's at Truro! I did not know that. He'll be with Harvey and Adelsbury then. Adelsbury is at Taunton Town. Not quite sure why!